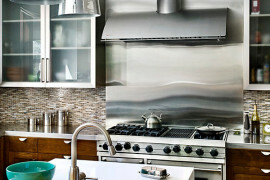 There’s been talk lately that stainless steel appliances are on their way out. Is it true? Well I can’t say for sure, but what about stainless steel kitchens? Yes, as in the kitchen cabinets and everything. Not sure how to feel about them? Maybe a few pictures will help you make up your mind and perhaps even fall in love with this take on sleek kitchen cabinetry. You can just imagine this kitchen with a white finish, as its traditional legs and even the faucet are not entirely modern. 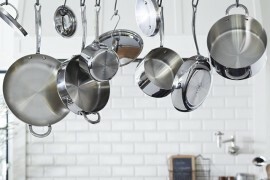 The stainless steel, however, gives this traditional look a very contemporary flair. 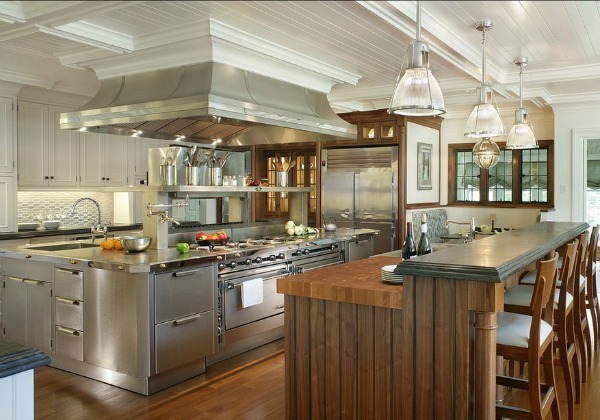 It’s almost easy to overlook the fact that this kitchen is full of stainless steel. 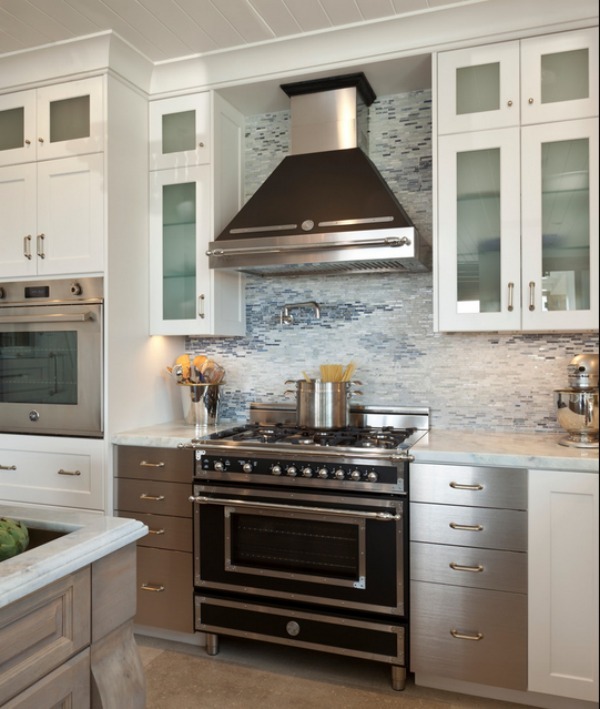 The details in the ceiling and upper cabinets are very much traditional, but this kitchen comes into the 21st century when we look at the countertops and lower cabinetry, which are all stainless steel and yet fit in perfectly with the more traditional pieces. 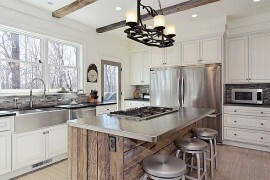 Another example of great use of lower cabinets in a traditional kitchen. 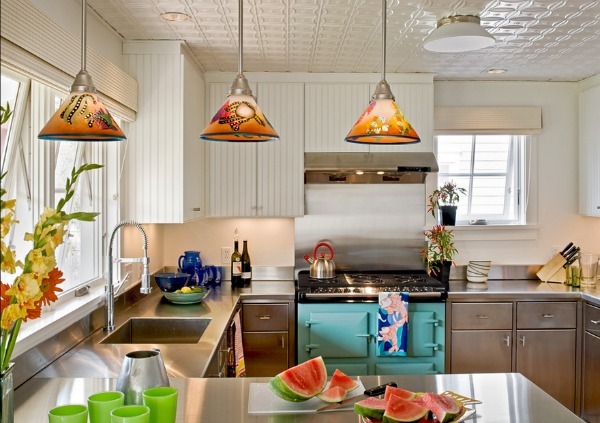 Here, there is much less stainless steel, but it works so well with the cool colors throughout the kitchen, like the backsplash and the glass on the doors. The grey on the island also pulls the silvery hues together very nicely! 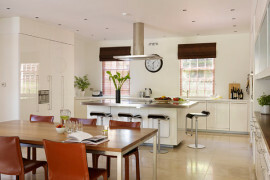 There is no doubt that this kitchen is stunning, and the mix of modern and traditional is so seamless! The center cooking area looks like it belongs in a professional chef’s kitchen, and the stove blends right in with the cabinets. 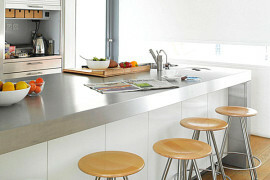 The result: the island stands as a whole, like a kitchen within a kitchen. Even the cabinet pulls match the handles on the oven – it’s brilliant. 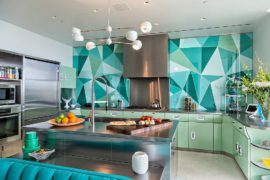 Stainless steel is anything but dull, and the spaces below are proof that covering your kitchen in it might just actually be a great idea! 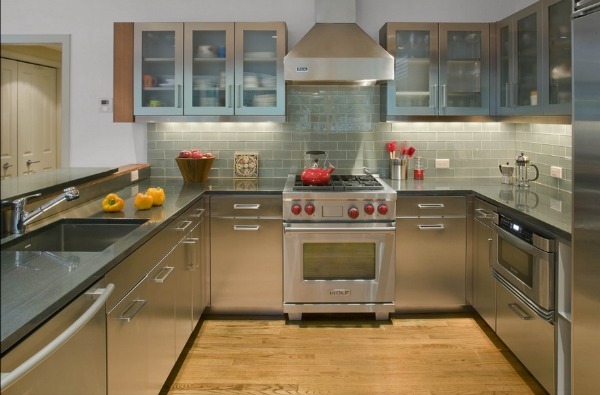 This kitchen has no shortage of the color grey, but the knobs on the stove pop right out and bring a little life to the stainless steel. Upper cabinets with glass doors open up the space and makes it feel even lighter. Somehow upper cabinets are not missed in this large, ultra modern space. It’s also kind of amazing how many different materials are used in this one room. The stone wall gives off the perfect glow in this kitchen, and the stainless steel cabinetry and countertops add a touch of glimmer, too! The brushed steel is a refreshing look for the stainless steel kitchen, which almost looks white with the light shining on it. The beauty of this design is in the subtlety of the mixture of materials. The wood cabinetry almost seems out of place until you notice the huge pantry to the left and it all comes together. The mix of stainless steel and natural stone is really effortless here since the marble’s grey tones match the cabinets so perfectly. 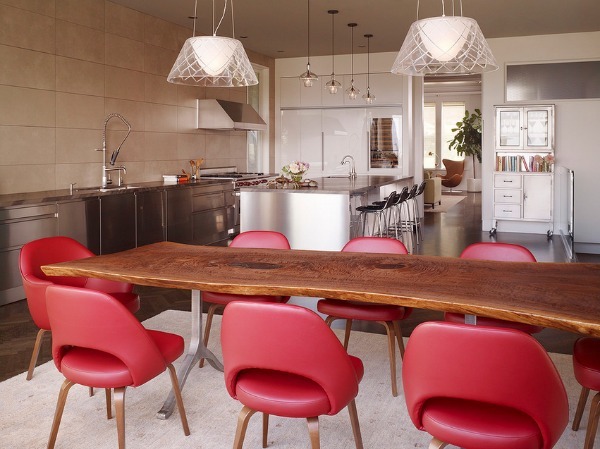 The touch of fun brought into this otherwise serious space via the chandelier above the table is so refreshing! 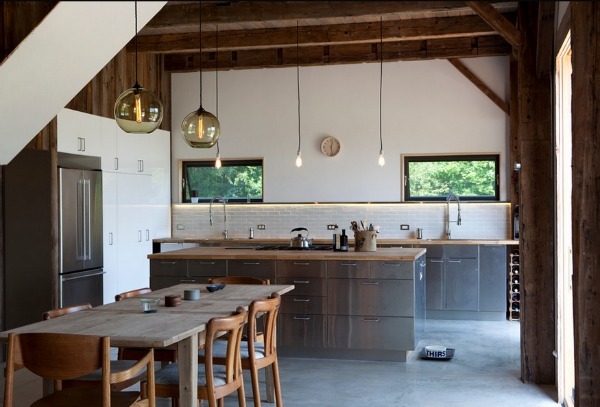 Super high ceilings, wooden beams and some super simple lighting make for a super cool kitchen in this home. The simplicity of the white wall with a plain clock on it is actually quite lovely, since we usually expect upper cabinets where those windows are. Also, did you notice the floors? Concrete has never looked so good! 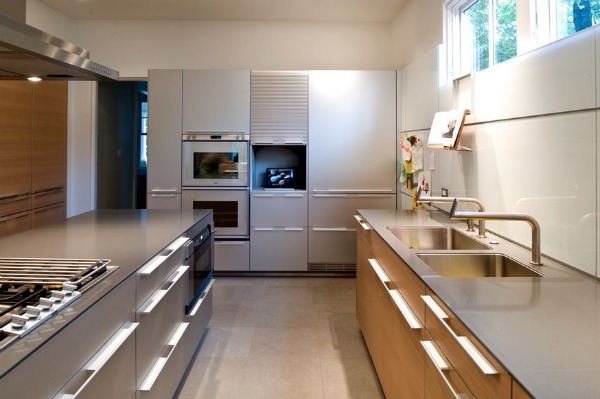 This space is just beyond cool, and I can’t even imagine this kitchen with any other cabinets other than stainless steel! I’m loving the contrast with the black-framed windows and the lighting. The island looks as if it floats in the middle of the room and the open shelving definitely helps with that. 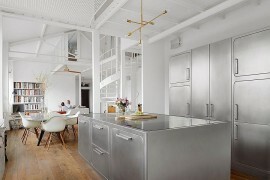 Exposed brick and stainless steel – who would’ve thought? Notice that there are over 5 different finishes here, but somehow it all comes together and just works. 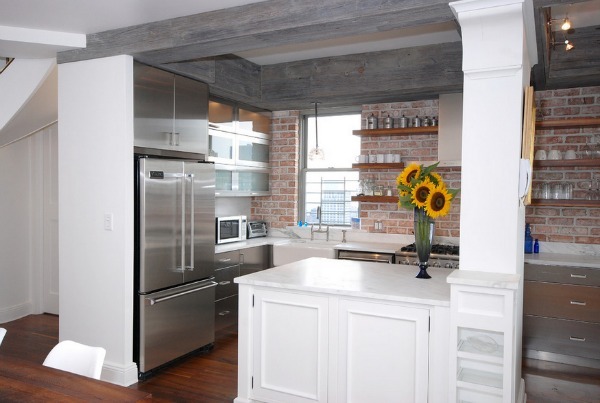 Exposed brick is pretty much always a good idea, and that’s certainly true in this kitchen! 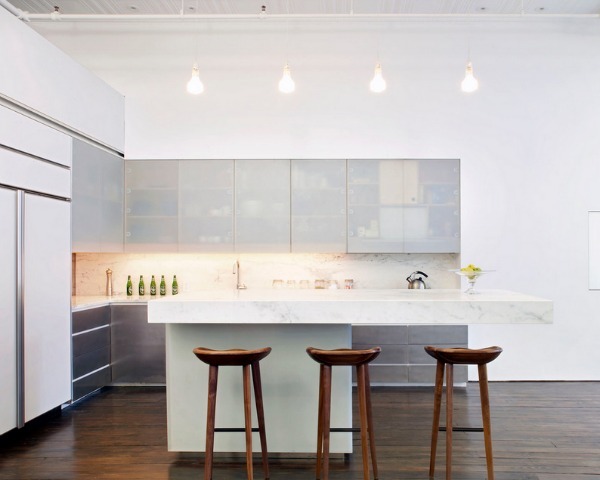 This loft-style kitchen is so simple and so beautiful! 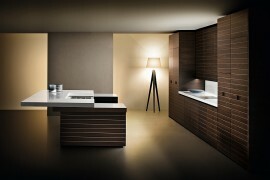 The simplicity of the materials used makes a stunning combination, and the whole space flows around the sleek kitchen. Also, more exposed brick, though this time painted white, serves as a beautifully textured background. 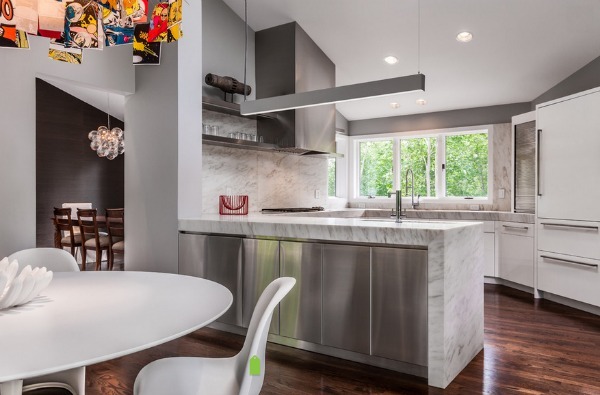 I hope these kitchens have inspired you and perhaps even convinced you that stainless steel cabinetry doesn’t just belong in restaurant kitchens. 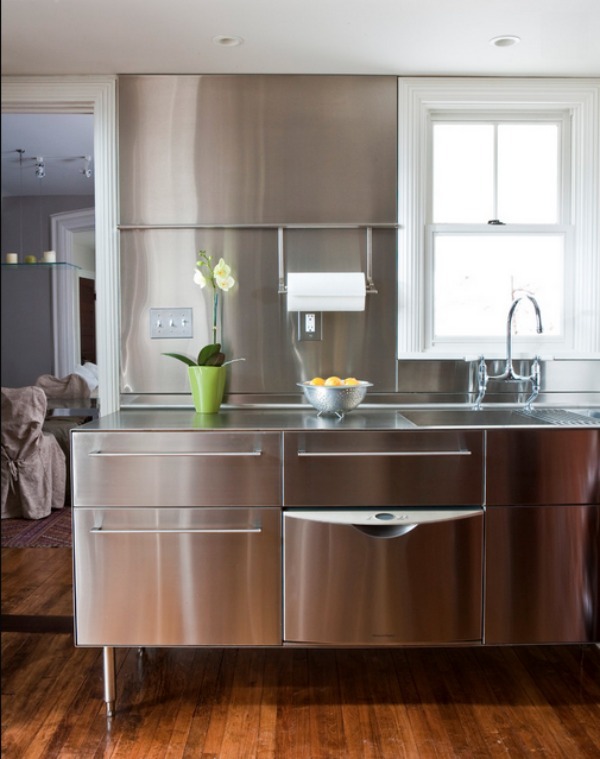 In fact, stainless steel can be a beautiful part of your home!